Treatment for glaucoma often begins with medicated eye drops. The goal of these medications is to lower the pressure in the eye (intraocular pressure) and prevent damage to the optic nerve. To gain the most benefits of these medications, use them exactly as prescribed by your eye doctor. Sometimes your doctor may prescribe more than one type of eye drop. In this case, check with your doctor about how long to wait between using each kind. Although eye drops for glaucoma can help save your vision, all of these medications have some side effects. In addition, some of the medication may be absorbed into the bloodstream, which can cause side effects that affect body parts other than your eyes. If you experience any of these side effects, tell your eye doctor. Do not stop taking your medicated eye drops unless you have spoken with your doctor. Using these eye drops as directed is the best way to help save your vision. Prostaglandins. These help reduce the pressure in your eye and increase the flow of fluid out of the eye. Beta blockers. Beta blockers help decrease the pressure in the eye and how much fluid is made in the eye. Alpha-adrenergic agonists. With this type of eye drop, you can increase the flow of fluid out of the eye and reduce how much fluid is made in the eye. Carbonic anhydrase inhibitors. These are used to reduce how much fluid is made in the eye. 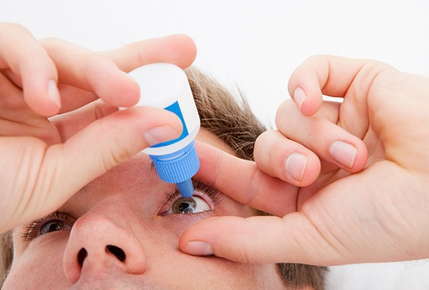 These types of eye drops are not used very often. Miotic or cholinergic agents. Using this type of eye drop helps increase the flow of fluid out of the eye. If you have a family history of glaucoma or are noticing problems with your vision, contact your ophthalmologist immediately for an appointment. He or she can help diagnose your vision problem and suggest appropriate treatment options.